Alfalfa (Medicago sativa) has one of the highest nutritional profiles of any plant or herb on the planet, making our potent 10:1 Alfalfa Extract an ideal daily supplement. 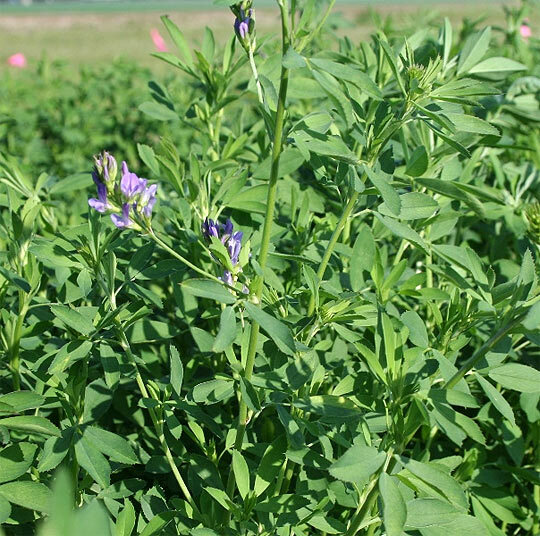 Alfalfa (Medicago sativa) has one of the highest nutritional profiles of any plant or herb on the planet. It contains high amounts of protein, calcium, other trace minerals, vitamins in the B group, vitamin C, vitamin D (including D2 & D3), vitamin E, and vitamin K, the plants 30ft long roots mean this amazing plant draws nutrients simply not available in the depleted earths nearer the surface. Alfalfa has been used as an herbal medicine for over 1,500 years. In early Chinese medicines, physicians used young alfalfa leaves to treat disorders related to the digestive tract and the kidneys. In Ayurvedic medicine, physicians used the leaves for treating poor digestion. Whether or not these benefits are down to the high nutritional profile of alfalfa or the phytoestrogens including Spinosterol it contains, is not clear. One unique aspect of alfalfa is that it naturally contains vitamin D2, normally only found in mushrooms. Because mushrooms are not allowed in certain forms of vegetarianism, including Jainism (Jain vegetariansim) and some vegans, alfalfa is one of the few natural sources of vitamin D2 available.